Vatican Museums are the largest complex of Museums togheter in the world. The guided Vatican Museums Private Tour will start at the entrance to the Vatican Museums. From here with your guide and privileged entrance, you will enjoy the panoramic view of the beautiful Vatican Gardens, you will continue to the Candelabra Gallery, the Gallery of Tapestries, the Maps Gallery and the Immaculate Conception room. Stop and free time inside the Sistine Chapel, where you can admire the divine frescoes of Genesis and the Last Judgment, the best work of Michelangelo Buonarroti as painter. The Sistine Chapel is one of the most famous art treasures of the Vatican City, built in 1477 by Pope Sixtus IV. The tour will continue with Saint Peter's Basilica, the largest church in the world, where you can see the famous Pietà sculptured by Michelangelo, the body of Pope Saint John XXIII and the splendid mosaics of the great artists of the School of the Vatican. The tour ends in St. Peter's Square with the famous Colonnade built in 1661 by the great Baroque master Gian Lorenzo Bernini, where you can enjoy some free time for photos. Tours in English with Dedicated expert tour Guide. Skip the long line to the Vatican Museums and St. Peter's Basilica. Availability: Everyday except Sunday when the sites remain closed. 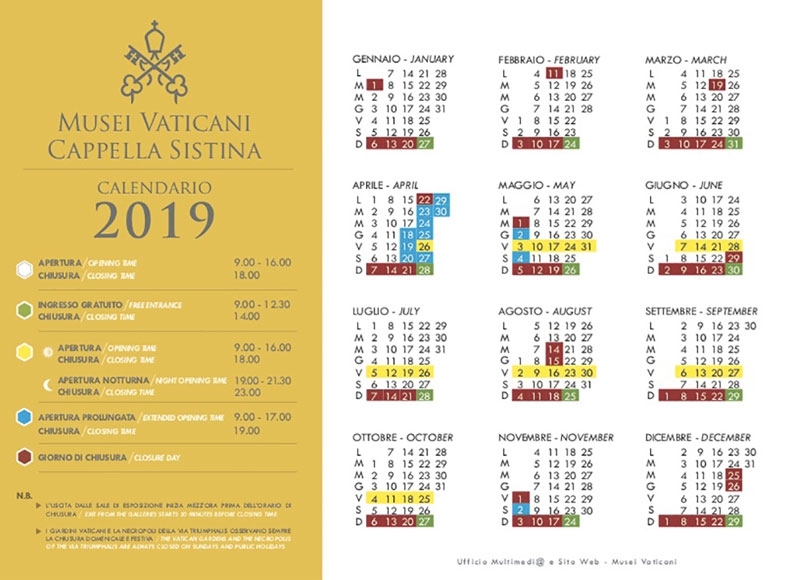 *We highly recommend for you to pre-purchase your Vatican tickets online yourself for a better rate on the tickets, we will send you the link to the "Vatican Museums online ticket office" by E-mail Once you fill out our reservation form below. We suggest to schedule your visit to the Vatican Museums in the afternoon around 1:30/2:00 PM, to avoid excessive affluence of groups in the morning. Note: Access to Vatican Museums, Sistine Chapel and Saint Peter's Basilica is permitted to visitors dressed appropriately (no sleeveless blouses, no miniskirts, no shorts, no hats allowed). For security reason no backpacks of any size are allowed, please do not bring any. Please fill out all fields to reserve this tour.